There are several variables that will determine the nutrition of your peanut butter sandwich. First there is the bread you use, particularly whether its white or whole grain. Then there’s the amount of peanut butter you use, which can vary significantly. 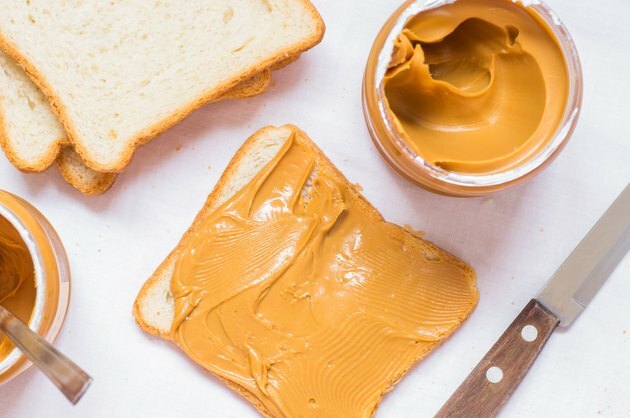 Finally, if you add something sweet like honey, jelly, jam or fruit, this will also affect the nutritional value of your peanut butter sandwich. The basic difference between white bread and whole wheat bread is that whole wheat bread has twice as much protein as white bread. This is because whole wheat bread is made from flour that includes the bran and germ, protein-rich parts of wheat. This is significant because both peanut butter and bread are incomplete proteins because they lack certain essential amino acids, but combined they create a complete protein. Whole wheat bread is a better pair for peanut butter than white bread. A typical slice of whole wheat bread has 4 grams of protein, whereas as a slice of white bread has just 2 grams. An ounce of peanut butter, about two tablespoons, has roughly 7 grams of protein. The 8 grams of protein in two slices of wheat bread makes 15 grams of protein in the sandwich. A sandwich with one ounce of peanut butter made from white bread would contain just 11 grams. A slice of bread has about 12 or 13 grams of carbohydrates no matter whether its white or whole wheat. According to the Mayo Clinic, a slice of whole wheat has three times as much dietary fiber as white bread. This is significant because the soluble fiber in whole wheat bread can actually lower blood sugar and cholesterol levels. Added to this, an ounce of peanut butter has about 6 grams of carbohydrate, 2 of which are dietary fiber. Men need at least 30 grams of fiber each day and women need at least 20, says the Mayo Clinic. Most of the calories in peanut butter come from fat. One ounce has about 16 grams of total fat. Natural brands that separate unless refrigerated have slightly less saturated fat, which explains why the oil rises to the top. But most of the fat in peanut butter of any kind is healthy monounsaturated fat. Bread has relatively little fat, with about 1 gram per slice. Neither bread nor peanut butter are a significant source of vitamins or minerals. Together, a peanut butter sandwich accounts for about 12 percent of your daily recommended intake of iron and about 7 percent of your daily calcium. If you add a small amount of honey, about half an ounce, you add little more than about 11 grams of sugar to the sandwich. Grape jelly has slightly less sugar, at 7 grams, but no more other significant nutritional benefit. The best way to add extra nutrition to your peanut butter sandwich is to use raw fruit. Just half a banana sliced up and included in your sandwich adds about 210 mg of potassium, or about 5 percent of your recommended daily intake. The same amount of preserves provide about 15 mg of potassium and 9 grams of sugar. A whole cup of raw strawberries provides 220 mg of potassium and less than 7 grams of sugar.